WILMINGTON, Mass. — Work on the heat shield for NASA's Orion Multi-Purpose Crew Vehicle — America's next-generation spacecraft that could transport astronauts on missions to Mars — is on track toward an ambitious test launch in 2014. Since spring, teams of engineers and technicians from Massachusetts-based Textron Defense Systems have been meticulously applying Avcoat, a proprietary thermal ablation and insulation material, to the heat shield, which will protect the Orion capsule and its crew from the extreme heat generated during high-speed re-entry into the atmosphere after a deep-space flight. The Orion vehicle is scheduled for launch into space without a crew in September of 2014 as part of its Exploration Flight Test-1 (EFT-1). The maiden flight will evaluate the system design and performance of the spacecraft, which is intended to send humans on future explorations of an asteroid, the moon and, ultimately, Mars. At 16.4 feet (5 meters) in diameter, the Orion heat shield is the largest and most advanced composite heat shield ever built. Textron originally developed the lightweight Avcoat ablative material in the 1960s for use on the Apollo command module. 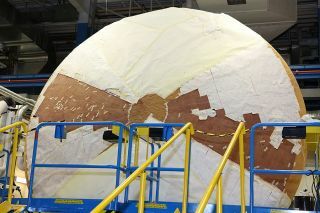 This view shows a bare honeycomb structure and one that has been filled with Avcoat using Textron’s “gunning” process. Made of epoxy novolac resin in a fiberglass honeycomb matrix, Avcoat works by "burning off" as it heats up, dissipating thermal energy away from the capsule's structure. The material had a 100 percent success rate during the Apollo, Skylab and Apollo-Soyuz programs, safely leading astronauts to 15 ocean splashdowns, and was thus chosen for the job of protecting Orion and its future crews as they head off to destinations never before visited by humans. "Avcoat is the only man-rated ablative material that exists today that can handle the extreme temperatures of high-speed re-entry following a deep-space mission," Ian Walsh, Textron Defense System's senior vice president and general manager, told SPACE.com. "We are proud to provide this state-of-the-art technology to NASA and help the country push the boundary of space exploration to the next level with our thermal protection material." After Textron completes applying the Avcoat, the shield will be flown down to Cape Canaveral, Fla., where it will be mated to the bottom of the Orion crew module for its 2014 orbital test flight. During this mission, the Orion capsule will be boosted atop a Delta IV Heavy rocket from Florida's Cape Canaveral Air Force Base to a distance of nearly 3,700 miles (6,000 km) from Earth — farther than any spacecraft built for humans has traveled since Apollo 17 in 1972. After completing two orbits, Orion's heat shield will be put to the test as the spacecraft plunges back to Earth, reaching speeds of up to 20,000 miles per hour (32,000 km/h) — faster than the space shuttle or any current spacecraft. The shield must be able to withstand temperatures up to 6,000 degrees Fahrenheit (3,300 degrees Celsius), more than half the surface temperature of the sun, as it re-enters Earth's atmosphere. Unlike the space shuttle, which landed on a runway like a commercial jetliner, the Orion capsule will parachute back to Earth Apollo-style, splashing down in the Pacific Ocean off the coast of California. If all tests go well, Orion's first full-scale but unmanned flight is expected to take place in 2017, during which the spacecraft will be launched on top of NASA's new Space Launch System. Imelda Joson and Edwin Aguirre can't wait to watch the launch of Orion's first astronaut crew from Cape Canaveral in 2021. Follow us @Spacedotcom, Facebook and Google+. Original article on SPACE.com.